Looking at our built environment we know about the large numbers of resources the construction industry consumes, how much waste is being generated and how much C02 is being emitted. Everyone agrees that the construction industry is one of the key areas when it comes to meeting the Paris Agreement. Therefore, it is no surprise that the word “sustainability” seems to be one of the most (mis-)used terms of our time. There are many organizations, large companies and local as well as federal governments working actively to change the direction of our economies, practices and our standards to overcome the peak on global CO2-emissions while reducing the amount of raw materials and waste. When it comes to our built environment the challenge is a more local one and comes down to every single building that is being designed and built right now. Depending on the region and country the life span of our buildings is somewhere between 10 to 35 years, sometimes even much longer than that. This long lifespan shows the great responsibility our buildings have regarding the climate goals but as well as their great social and economic impact. The aim for all our buildings should be to make them truly sustainable by realizing a high level of quality and by creating buildings which make sense in their cultural and climatic context and therefore quickly become an important part of its context in a way that people recognize them as a positive space where they like to be. Loss of local identity due to global modernism? Looking at our buildings all over the world today this aim has not been achieved on a wide scale. From “just” sustainability many years ago it is today health and wellbeing or the smartness of all buildings and cities. And the result: cities that look more or less the same by trading their local identity against the urge for a global modernism. But does a high rated office building in Hong Kong really need to have the same characteristics like one in Berlin? Sadly, the reality is that many of those high-end and mostly completely glazed towers compensate their lack of local adaption regarding their architecture with energy. Regarding the things being decided in the Paris Agreement these buildings are working against the agreement. And we have to ask ourselves if the performance of those “modern” buildings really is better and if people feel comfortable, healthy and happy. Therefore, perhaps now it is the time we should ask ourselves if this is the right strategy. Maybe the question everyone within the building industry should ask is what we have learned from our own experience and what we can learn from different cultures. To design and construct buildings has such a long tradition and looking at our existing building stock is the largest case study of all times. We know so much and understand what is working and what needs improvement but in too many cases it seems like this is not taking into consideration. One of the key fundamentals of learning is to make mistakes but this is what we don’t openly apply when we design, build and maintain our built environment. We don’t typically discuss mistakes and therefore we are not really seeing much open reflection before the newest trend is being implemented. In our digitalized and globalized world, one could assume that all the knowledge from so many centuries of designing and constructing buildings would be accumulated and utilized to build on that. But what we see is an increasing default of “one fits all” or “one click solutions”. Everything has to be simplified ideally to an app where the intelligence is programmed into the tool. Requirements for our buildings are being standardized no matter where the building will be and regardless of the climate conditions. Following what Frank Lloyd Wright already said: “we create our buildings and then they create us.” – Let’s actively create our build environment by sharing what we know and by building on it. We have to start to make sustainably the new normal by always going the extra mile and to push for the right solutions in order to create 2050 ready climate and cultural sensible buildings today! Dr. Christine Lemaitre was born in Gießen, Germany in 1975 and studied structural engineering at the University of Stuttgart from 1995 to 2000. After receiving her diploma, she moved to the USA and worked for 2 years for Heery international in Atlanta as a structural engineer where she worked on several projects such as the Georgia World Congress Center or a research facility in Tennessee. In 2003 she started working as a research and teaching assistant for Prof. Werner Sobek at the Institute for Lightweight Structures and Conceptional Design at the University of Stuttgart. Influenced by the so-called Stuttgart school of lightweight structures where the sensible design of structures regarding the used materials as well as their aesthetic appearance has been developed over many years she went into the research field of adaptive lightweight structures. The concept of replacing material with energy in order to minimize the structural weight as much as possible was first introduced by aerospace engineering. Transferring this design approach into structural systems for bridges or buildings and how that would influence the topology of those systems was the topic of her research. She completed her PhD thesis “topology optimization of adaptive truss structures” in 2008. As a teaching assistant Christine as well worked interdisciplinary with engineering as well as with architectural students. During her time at the Institute she taught structural design as well as supervised architectural design classes. Her main focus of working with architectural students was on innovation, new materials and design for deconstruction. In 2007, she started as project manager with Bilfinger Berger AG for a joint R&D project of Bilfinger Berger together with Züblin around resource efficient buildings and how new technologies could create more sustainable buildings. Her role was to lead an interdisciplinary project team and engage external stakeholders such as building material manufacturers and research facilities. In January 2009 she took on the role as director certification system of the German Sustainable Building Council. Under her leadership the DGNB System was adapted to several building types by engaging the membership in several working groups and to test the developed criteria in respective pilot phases. 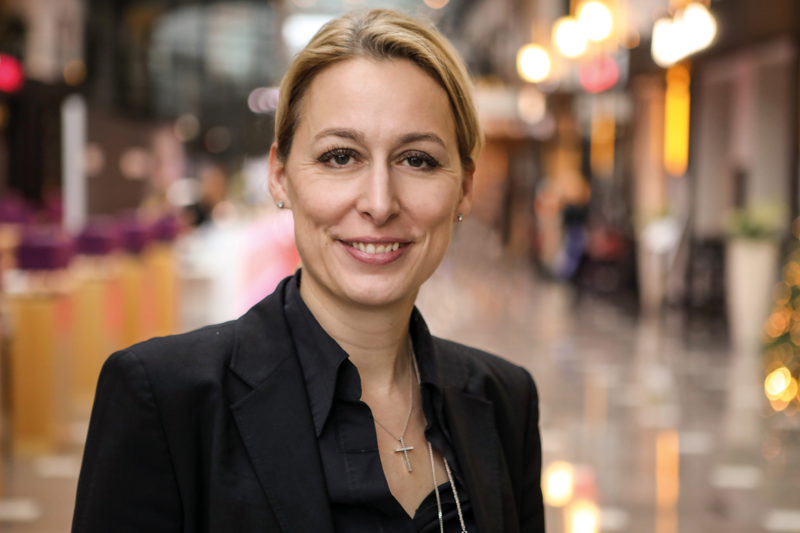 Since February 2010 Dr. Christine Lemaitre is the CEO of the German Sustainable Building Council. Since then she has been growing the organization regarding its members, certifications and trainings. The DGNB is the largest green building council in Europe today and has developed and maintained the most advanced certification system for buildings and city districts. Christine is also responsible for developing the international activities of the DGNB and has developed and fostered very successful collaborations with likeminded Green Building Councils in Denmark, Austria, Switzerland and Bulgaria. By introducing the Version 2018 of the DGNB System the organization has taken its certification system to the next level. Christine has been actively promoting and designing the strategy and the key elements of this very unique approach by introducing as the first system worldwide circular economy into a building certification system. DGNB has thereby created a tool which is fostering innovation by incorporating innovation spaces in almost all criteria and is focusing on future challenges by addressing the agenda 2030 goals as well as the SDGs of the UN. The DGNB is one of the first established Green Building Councils and since 2015 she is Chair of the European Regional Network (ERN) of the World Green Building Council. Since 2016 she is board member of the World Green Building Council (WGBC). She is also a member of the Advisory Council for Baukultur of the State of Baden-Württemberg and of the Sustainability Board of the German Property Federation (ZIA). Christine is a true believer in making a positive contribution to our global challenges through buildings and is a dedicated advocate for more and transparent quality of our built environment.